David Bromberg's new album, Only Slightly Mad, is out now. This is the latest from The Bluesmobile’s C.C. Rider, who spends her life venerating the founding fathers of the blues. She’s walked the crooked highways of this singing country to resurrect the voices of the past. With the dirt of the Delta on her hands, she sleeps in the shadow of the giants on whose shoulders popular music now stands. 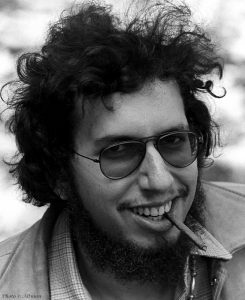 As a college student in the 1960’s, a young guitarist named David Bromberg found himself smack dab in the middle of the folk blues revival. And ended up living a life all the rest of us blues fans could only dream of. Bromberg performed with Muddy Waters. Was a close friend of Mississippi John Hurt. And learned how to pick a mean guitar from the best of ‘em—master picker and blues legend Reverend Gary Davis. C.C. Rider, who spends her life venerating the founding fathers of the blues. She’s walked the crooked highways of this singing country to resurrect the voices of the past. With the dirt of the Delta on her hands, she sleeps in the shadow of the giants on whose shoulders popular music now stands.